WAKE COUNTY – We regret to announce the loss of Cary Fire Captain Jon Schondelmayer who died on Wednesday, December 18, 2013. Captain Schondelmayer was serving Wednesday at the Swift Creek Volunteer Fire Department, which is adjacent to the Town of Cary. Schondelmayer began feeling ill, and 911 was called for EMS. EMS and Fire Department personnel were not able to revive Jon. 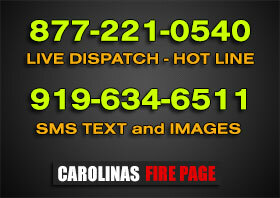 The Swift Creek and Cary Fire Departments are jointly working on arrangements. They will be posted here when available. On the morning of December 18, 2013, Firefighter Schondelmayer was working with Swift Creek Fire Department as a firefighter when he begin to feel ill. He communicated to his crew at approximately 1130hrs that he was going to go home to get some medicine and return to the station. His crew became concerned when he left and called him on his cell phone to check to see how he was doing. At the same time, a Swift Creek firefighter was sent to his residence. While on the telephone, Schondelmayer communicated that he did not feel well and needed assistance. When the other Swift Creek firefighter arrived at the residence, he found Firefighter Schondelmayer unresponsive. Schondelmayer’s fellow responder began rendering medical aid and contacted his company at Swift Creek for assistance. Emergency responders worked for 50 minutes to try to revive Firefighter Schondelmayer but he passed away from a nature and cause of injury still to be determined and reported. Firefighter Schondelmayer was also a Fire Captain with the Cary Fire Department, North Carolina, and had just come off of a busy shift with Cary that included several emergency response runs before beginning duty that day with the Swift Creek Rural Fire Department. Fire apparatus attending the visitation on Sunday, December 22 should park at the Greenwood Forest Baptist parking lot, 110 SE Maynard Road. Access the parking lot using the Kilmayne Drive entrance; a staging officer will be onsite to facilitate parking beginning at 3 p.m.
Fire apparatus attending the funeral on Monday, December 23 should report to the Colonial Baptist Church, 6051 Tryon Road, Cary and enter the parking lot using the western entrance on Tryon Road; a staging officer will be onsite to facilitate parking beginning at noon. Following the funeral, a private procession will leave from the Colonial Baptist Church to the Brown-Wynne Funeral Home in Raleigh for a final farewell. With questions, please contact Cary Fire Department Captain Paul Hudson at (919) 524-6353 or paul.hudson@townofcary.org.